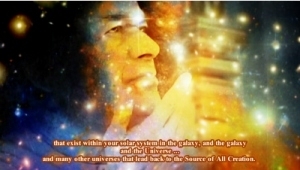 ❝ It is I, Cosmic Sai Baba! And I am very pleased to be here. Very pleased indeed. I have been in the room, and I have been listening. And sometimes I have actually prompted; prompted a thought to you so that you would discuss these things; so you will need to think about what has been discussed in this meeting, today. When I say I have prompted, I mean I have – shall we say – an image of a little lamp that’s just near you; and if you pick up that energy and accept it and make it your own, that is your choice. For that reason, we are not considered to be interfering, if you understand. But here, this morning, it is a difficult time at the present, and there have been words spoken about a heavy darkness present … that is like a wall, and these are words that I have left floating for people to pick up (if that makes sense) and use it in their language because it is … it is just that. It is a wall of heavy darkness that this Earth, this planet, your solar system is flowing through at this time. It will pass. But with the heaviness of darkness, it actually can revive memories of times when this planet was very lost in heavy darkness. And so with that memory, it can bring forth memories that you may feel are happening now or will happen in the future, But I can assure you, they will not. From now on, the Earth, the planet, will move on; will move forward. It is on its way to become what we have always referred to as The Golden Age. So if you can just “ride with it” and understand that it is, uh, moving … moving in a circle – you are moving in it, or through it; just allow yourselves not to be affected too much by this. But rather: PRAY A LOT; it will help; CHANT A LOT, it will help. And try to clear your mind (or your brain) from – what can I say – focussing on something that will only harm you or hurt your feelings; it is not necessary. Just move on. Just allow this time to take place because it is time here on this planet and you find it will pass; it will pass very soon. But, for the moment, that is very difficult. We are aware of this. We star-people are aware of the heaviness and the problems that all beings on this Earth are going through at this time. All I can say, and reassure you is, “it will pass”. So, if you trust me and listen, you will feel it in your heart. For your Heart is also telling you not to take on any energy because is not yours. You are passing through it, you are passing by it, you feel it; but there is no need to carry it, so let it go. I implore you to do this. But it is the choice, of course. It is up to you. It is up to you. It is your choice. You are living your life here on this planet, where I am visiting – right at this moment. And it is heavy … … with the darkness. But let it flow, because it will not stay; and it will feel much better as it goes, as it leaves. So with that, that is really my main energy of information that I have for you, because everything is energy and I would like you to remember that and think about that! And energy that is heavy can be replaced with energy that is light. It comes directly from the Creative Source of ALL, which is Love. Universal love; so focus on that. Replace any darkness with that. Thank you my children. But before I go I would like to thank all those that have written to me. And I bless them, I bless them for writing. I know many are troubled, but many are grateful, also. So think about that. For, being grateful will help you connect to the higher energy from the Source of ALL. Because we are always here to assist. Thank you my children.